My trips out to the fashion retailers have become more of a source of inspiration for me than actual shopping trips. There are some things that are not so easy to make. I’m not going to lie, I don’t think I would want to even try and make a pair of shoes. But earrings? Easy peasy! And what’s so nice about making your own stuff, and I know I have said this before, is you get to have the length, colour, style, materials, whatever, just the way you want. Not what the fashion stores happen to have in stock. 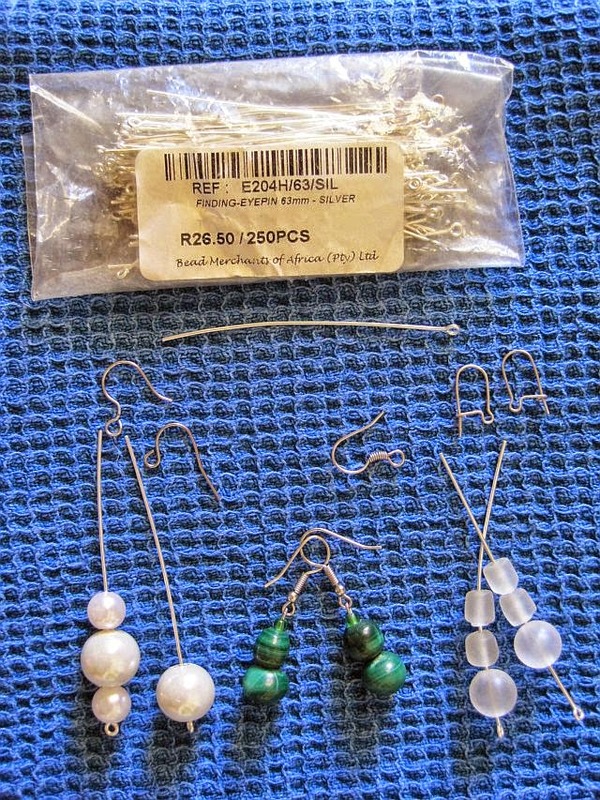 In the first picture I showed the bits you need to make these easy earrings. An eye pin, which is a piece of wire with an O shaped loop at the end. Hooks to fit through your ear lobes. They come in slightly differing styles. Hopefully you can see three different types in the picture. And then beads. You could use feathers, coins, ribbon, just about anything you wanted to. I used beads. Pearl beads, malachite and matte glass beads. 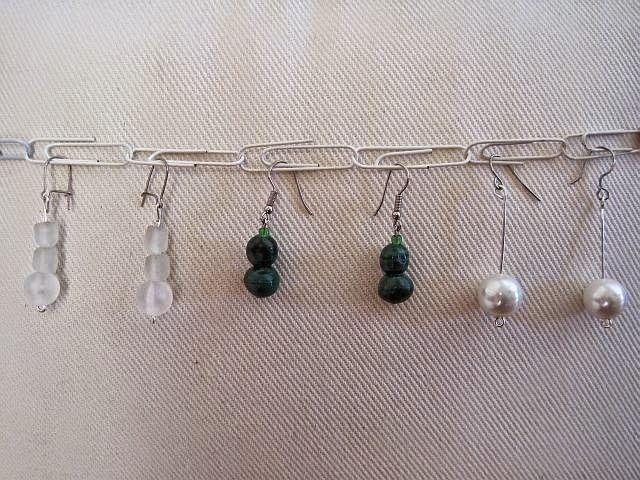 To make the earrings, you load the beads on to the eye pin. Bend and attach the eye pin to the hook part with a pair of pliers and that is it! You’re done. The finished earrings are in the picture to the right. At the top of the page are the Greenie Galleries, which are an archive of things I have made. My primary focus is to DIY and not buy. Hard, I know. But hopefully something amongst the pics will inspire you.